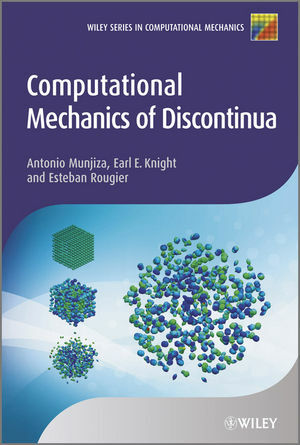 Mechanics of Discontinua is the first book to comprehensively tackle both the theory ofthis rapidly developing topic and the applications that span a broad field of scientific and engineering disciplines, from traditional engineering to physics of particulates, nano-technology and micro-flows. Authored by a leading researcher who has been at the cutting edge of discontinua simulation developments over the last 15 years, the book is organized into four parts: introductory knowledge, solvers, methods and applications. In the first chapter a short revision of Continuum Mechanics together with tensorial calculus is introduced. Also, a short introduction to the finite element method is given. The second part of the book introduces key aspects of the subject. These include a diverse field of applications, together with fundamental theoretical and algorithmic aspects common to all methods of Mechanics of Discontinua. The third part of the book proceeds with the most important computational and simulation methods including Discrete Element Methods, the Combined Finite-Discrete Element Method, Molecular Dynamics Methods, Fracture and Fragmentation solvers and Fluid Coupling. After these the reader is introduced to applications stretching from traditional engineering and industry (such as mining, oil industry, powders) to nanotechnology, medical and science. Ante Munjiza is professor of computational mechanics in the Department of Computational Mechanics at Queen Mary College, London. His research interests include finite element methods, discrete element methods, molecular dynamics, structures and solids, structural dynamics, software engineering, blasts, impacts, and nanomaterials. He has authored one book, The Combined Finite-Discrete Element Method (Wiley 2004), and over 110 refereed journal papers. In addition, he is on the editorial board of seven international journals. Dr Munjiza is widely recognised as a key international expert in computational mechanics of discontinua. He is also an accomplished software engineer with three research codes behind him and one commercial code all based on his technology. Esteban Rougier is a Post Doctoral Research Associate at LANL. He has received his Ph.D. from Queen Mary, University of London in 2008` on Computational Mechanics of Discontinuum and its Application to the Simulation of Micro-Flows.